NieR Automata is a brilliant game, and I’m still in a semi-stupor that it’s actually a thing that exists. The original NieR, which released on PlayStation 3 and Xbox 360 back in 2010, wasn’t reviewed in the highest regard. Most of the complaints were about the gameplay and combat, though praise was given to the unconventional story presentation and excellent score. The sum total earned it middling marks, and sadly, the game was overlooked by many. 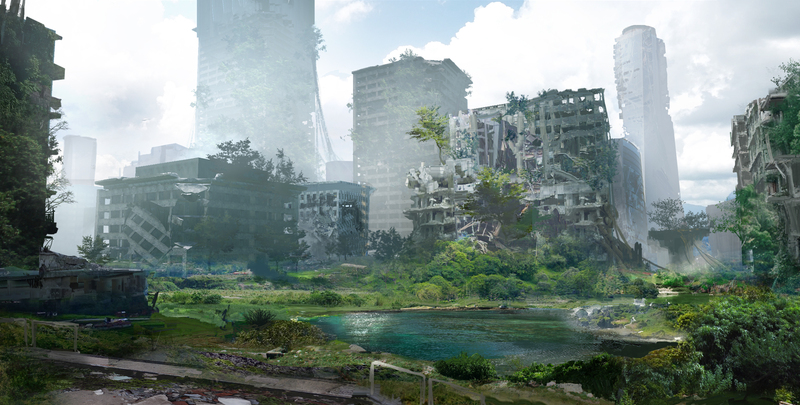 It seemed like NieR’s future was rather dim, which is why the reveal at E3 2015 was a curious thing. That’s typically been the case for Automata director Yoko Taro’s endeavours with Square Enix and cavia. There’s no denying the cult following that’s rallied behind the Drakengard and NieR series, willing to overlook the flaws for their honest strengths. Now, we have Platinum co-developing the game instead of cavia, and let’s just say their pedigree for action games is unmatched at the moment, or at least their reputation for it. I mean, it sounds like it’s a perfect match right? Essentially, shoring up all of what was problematic with NieR with one of the best in the business. I’m happy to report that the result is a massive success and I think it’s one that I feel can snugly fit alongside Square Enix’s most highly-regarded classics. It’s going to be hard to explain exactly what makes Automata’s story and characters great without descending into turbo-spoiler territory, but I’ll do the best job I can. Automata begins on Earth, nearly ten-thousand years into the future. Humanity has been driven to the moon after aliens invade, using machine lifeforms to wipe out nearly all of the population. The last vestiges of civilization construct androids to send back to the planet in an effort to defeat the alien/machine forces, and take back their home. What they discover is that some machines are mysteriously displaying attributes of humanity, seemingly of their own volition. Moreover, not every machine is linked in a malevolent network. 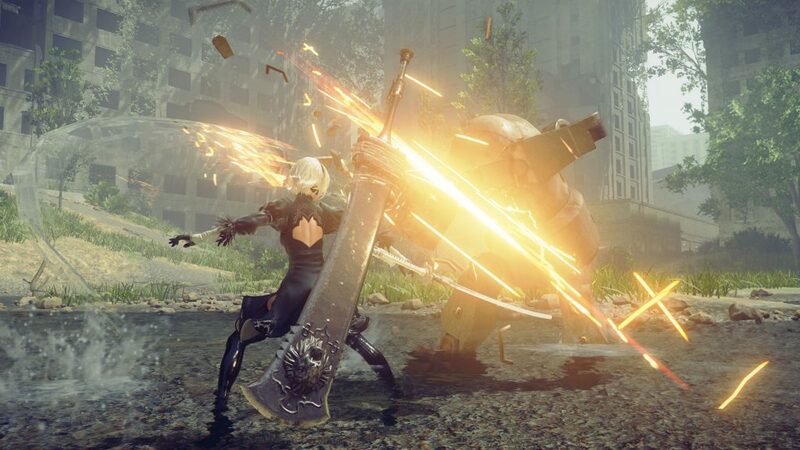 2B and 9S encounter friendly machines like Pascal, a devoted pacifist who was severed from the network and harbors others like him in a clandestine village. This is one of the most fascinating parts of Automata’s story. You have the androids who, by design, are about as close to human as one could be but aren’t, the machines, who are beginning to understand and adopt human characteristics, and 2B and 9S’s “pods”, which are bona fide personal assistants. You see what it’s like for each type of intelligence to wrestle with what they understand humanity to be. It establishes a captivating backdrop for the characters, who are also a treat to watch evolve. YorHa employs androids for a variety of different tasks: 2B is a android designed for battle, while 9S is designed as a “Scanner”, a scout of sorts. 2B is entirely focused on completing her objectives, and exudes a cold, uncaring demeanor. That’s why 9S is a nice foil. While he’s just as apprehensive about trusting the machines as his counterpart, his kindness is what allows him to urge 2B to curb her instincts to merely destroy them all. As they discover what the machines interpret humanity to be, you also see their own understanding emerge — not only in how they see the world but also how they see each other. It builds a sturdy foundation for where the story takes them, and it will take them places. There are many twists ahead, and I found myself on the edge of my seat quite a few times. While Automata is very much its own story with no need to play the original NieR or Drakengard series, it does take place in the same universe. There’s definitely food here for the faithful in the form of returning characters, but it’s all kept respectfully in the background of what Automata is trying to do. It should be noted that, like its predecessors, Automata has multiple endings that significantly affect the story and its conclusion – which I highly recommend seeing it through to the End. Your first trip will likely take you anywhere between 12-20 hours to complete your first run through, but it’s easy to get lost in the various questlines the game piles on your plate and spend significantly more time than that. The Earth that humanity has left behind is a desolate place, but not without life. Massive trees have gnarled around enormous buildings that housed an uncountable number of humans. A vast desert where the only things poking from the sand are fragments of a world that once was. The little fauna left are mostly – oddly – moose and boar. Oh, and there are the machines. The world that director Yoko Taro and Platinum have built is a very eerie one. A world that seems to beckon questions around every bend, asking “what happened here?” How did things go so wrong? Is reclaiming the Earth even possible? The art direction appropriately makes use of very muted colors, and will sometimes go as far as a near-total desaturation when visiting the Bunker — the home base of YoRHa. It’s all beautifully annotated with an incredible soundtrack by Keiichi Okabe and is replete with many vocal tracks that seem to cry out desperately and invite you wrap your head around the mysteries of this broken world. What’s also great is that the game liberally uses phasing in its sound design. For example, after speaking to Anemone at the Resistance camp, vocals slowly filter in and match the rest of the song. It’s a lovely touch, and there are many creative ways the game employs this. While it’s not the biggest world, (not that it matters as much as what’s done with it), it is an open world. With it you can expect many of the same features: the ability to fast travel and quests that take you hither and thither uninhibited by load times when traveling on foot. When you’re not engaged in the main string of quests, you can take on a bunch of sidequests from the Resistance camp and various other amicable parties. Many of these sidequests quests offer an interesting insight into characters that inhabit the world. Some are quite silly and charming, such as a quest from a machine named Sartre who has apparently discovered human philosophy and existentialism, or a machine hermit who nurtures forest animals back to health. While many may take the form of simple fetch quests, there’s usually something interesting going on story-wise, which is more than enough to keep you engaged if you go off the beaten path. Now, I have a bit of a gaming confession to make: Automata is my first Platinum game. They’ve become a bit of a darling with well-received action games like Bayonetta 2 and Metal Gear Rising: Revengeance, and it seems that pedigree is well represented in Automata. I totally get the praise now. Here’s my explanation. What I feel makes Automata’s combat excellent is that it doesn’t get in your way. It empowers you to go all-out, to go toe-to-toe with enemies with a degree of confidence that you have the tools available to you to react appropriately – but not so much that it starts feeling like a brainless hack-and-slash. Evading and countering incredibly satisfying, because it’s entirely dependent on your reaction to tells rather than navigating a game’s physics system on top of it. When you do get hit, you know it’s your fault. Bosses are designed well for the most part, and offer some interesting and unique mechanics. There’s a few that are a little dull, but it still feels great to thrash them. Like the original NieR, Automata isn’t afraid to suddenly change up the genres at the drop of a hat, something that I find incredibly cool when it’s done right. Most of the time, this will take the form of a shmup, which, bizarrely, works quite well. All of the segments are exciting and not too difficult to complete on normal difficulty, even for someone like me who really hasn’t acclimated themselves to the genre. Controls are generally preserved from the action segments so you don’t feel blindsided by the switch-up. 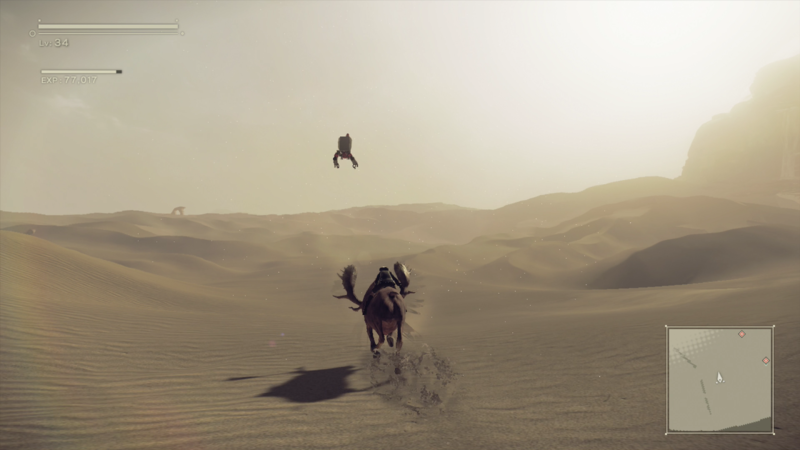 The game will also change perspectives on frequent occasion – from a free camera, to top-down, to side scrolling. Thankfully, the controls also don’t fall behind when this happens, which doesn’t take you out of the moment. These were things present in the original NieR and it’s commendable that Yoko Taro and Platinum didn’t just leave it in the past — that they could reinvent these ideas in a much more sound way. You can customize your android protagonist with a wide variety of plug-in chips that contain different active and passive abilities. Weapons can also be upgraded with materials you collect on the battlefield, and your personal pod can switch to different programs that alter its abilities. There was a lot more here than I was expecting, which left me pleasantly surprised. It’s this reason that I spent nearly 70 hours with Automata and I’ve still got more I’m excited to do. NieR Automata’s excellence is something that slowly seeps into you as you play on, from the engaging combat and RPG mechanics, to the compelling story and characters. Platinum brings their expertise in engaging gameplay, and fully brings Yoko Taro’s madness to the fore. I found very little to fault in the game, aside from some slight performance issues on PlayStation 4 where the frame-rate would stutter every now and then. Noticeable, but thankfully never a distraction. To kind of encapsulate this whole thing, I just want to say that a sequel to NieR probably wasn’t at the top of the list when it comes to new games I expected out of Square Enix. 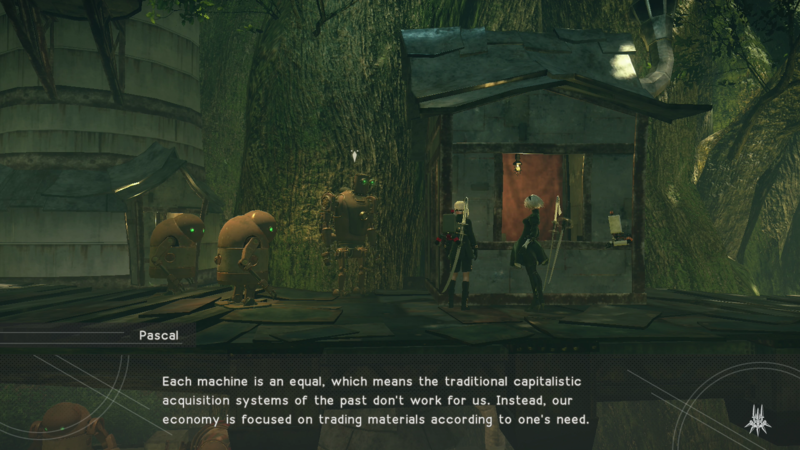 Clearly, they see a lot of potential in Yoko Taro, and thanks to Automata, I think many new fans will. I am glad to go with them on whatever ride comes next. I highly recommend NieR Automata to anyone who loves a great action game with a clever, well-written story. Disclaimer: A PlayStation 4 version of NieR Automata was provided to Nova Crystallis by Square Enix for review. Posted in Headlines, NieR, Reviews, Special. Can’t wait to play this little gem on PC ! Excellent combat and story and characters. Terrible maps devoid of compasses. Side quest don’t let you know about enemy difficulty. You can run in lv 38 foes while you’re lv 12. And hiding enemies off screen is the sidescroller and top down parts is a tactic they use the whole game. There’s also some glitches with the dead android bodies that prevent you from climbing ladders. And the washed out look to the world makes ever tiny bit of light look like an item. You can’t switch characters on the fly but some enemies can’t die until you access skills from 9S, like hacking. I had no expectations for this title, it looked like a generic anime action game that would score in the low 70s across the board, but I am so happy to be wrong. The game is a masterpiece on so many levels. The brilliant tight combat, the unconventional and emotional story, the amazing soundtrack, and the interconnected world filled with secrets. Nier Automata is honestly my contender with P5 for the best game in 2017. Just started A2’s campaign and already 40hours in. Will aim to platinum the game (no pun intended). This is SE’s saving grace really. I’m glad they put out a game that at least comes close to amazing against Guerilla and Nintendo but not enough to best the two apparently. The best in the Drakengard/Nier series so far. I skipped the review because I wanted to avoid spoilers; I just wanted to say that I’m on my 3rd playthrough and the game is different enough on each subsequent playthrough. This game is insanely fun. Meh, I feel as though most people are tired enough of the standard openworld affair that this game bests them by not being like them. Point taken. But I have to disagree. Majority of the gamer fanbase are into the Open-world Genre. As seen with Zelda and Horizon. SE falls flat with narrative for some strange reason. I’ve had it set to “Hard” since the beginning… some of these enemies just one-shot me… I might as well be playing on “Very Hard.” hehe. I just finished the first playthrough. This game is amazing! I could say many-many little things that makes this game great but I don’t want to spoil anything for future players. I was invested in 2B’s and 9S’s relationship and the story. This game dares to defy anything that is set for AAA titles and hits the right notes. Has some Japanese corkyness but I wouldn’t like it any other way. Writing is brilliant, doesn’t afraid to ask serious questions. I was hoping to get a good game from Platinum and Yoko Taro but it exceeded my expectations so far. I’m glad Nier:Automata didn’t came out in the same timeframe as FFXV. They would have seriously fought for my time and looking back Nier would have won the battle. Superior in almost every standpoint. Maybe not on the hair tech. The gold robots. You can chip damage them but it’ll take like 30mins to kill them without 9S’ hacking. I never played the first Nier, and got this only because of the combat. But man am I entranced by the game! The combat is even better than I expected, and for the first time, I’m having to press more than 3 buttons at the same time, which is really fun. The music, too, is amazing, and I’ve even fished for 5 hours just listening to it. Liking it so far and looking forward to spending more time on it before Persona 5 comes out! Ah. I never tried killing those. I just dashed past them. Hehe. Eagerly awaiting the next game from these two powerhouses (hopefully one that is connected to Automata in one way or another). I have to agree with you that the map design is terrible. I love the game, love the combat, the story, and the characters. However, I get frustrated a lot of times because I don’t know where to go. The map and the destination icon/place marker does not help much at all (at least for me). I really want to continue playing the game, but it’s no fun to spend hours upon hours running around like a chicken trying to find a way to get to the destination. I hope they release a patch to fix the map and make better maps for their future games because I really like Platinum games and Nier specifically. I just don’t get why didn’t they put a compass on the map? I turned my mini-map rotation off just to get a feel for what north was.